ADDvantage delivers Delaware FSBO sellers the most comprehensive flat fee MLS programs available. We offer customized flat fee MLS listing plans, each designed to meet the needs of Delaware FSBO home sellers. Our #1 recommended Altru® contract-to-close flat fee listing program takes the worry out of listing as a self-represented flat fee seller and may just get you more money for your home. Read our flat fee listed client testimonials and our listing agreements for flat rate MLS sellers and you too will be convinced that we are the most straight-forward MLS Listing Service in Delaware. GetMoreOffers.com®: professional, reliable, 100% transparent - never any hidden fees or gimmicks. Members of multiple Delaware MLS boards, GetMoreOffers.com® has been a flat fee listing broker for many years and a real estate broker even longer. Flat Fee MLS Delaware...Save 50% when selling a home "by owner"
Preservation of capital is what Delaware home sellers need right now. When selling a home, consider using a flat fee MLS listing with the ADDvantage® Real Estate Network. We will save you about 50% in selling commissions. Whether you live in New Castle, Sussex or Kent Counties we will list your property in your local MLS. Once a client, you can edit your listing anytime by logging to your account and change price, commission, pictures or your property description. Listing in the MLS at a low flat rate saves you money and puts the control in your hands. Internet marketing is critical to your successful sale. Most full-service agents don't have the resources to create Internet marketing programs. The ADDvantage® Real Estate Network will list your property on important real estate sites such as Realtor.com, local IDX feed broker and agent sites, Craigslist and many more. For those seller's who want to offer buyer agents a higher than average incentive, we offer Street Smart ADDvantage®...Our Realtor eblast program. Twice a month, most Realtors® in your neighborhood will receive our Street Smart ADDvantage® eblast which details all of our properties that are offering a 4% or > buyer's agent commission. The Street Smart ADDvantage® eblast is the best read Realtor-to-Realtor in the Untied States. Listing Flat Fee MLS in Delaware? Pass your commission savings on to the buyer and get SOLD! Look like all other listings in the DE MLS. Package your Delaware flat fee listing so Realtors® will see your listing in the MLS exactly the same as a full-service agent's listing. List flat fee with Altru® and you'll get more Realtor® showings, worry less about negotiating or filing disclosures, have less stress and likely get a higher sale price. Use a professional yard sign. Realtors® fear For Sale By Owner signs (white and red; generic) because they mean FSBO and not necessarily offering a commission. As well, FSBO signs promote the seller's own phone number and that is not what a Realtor® wants their client to see. The ideal solution is to use a metal GetMoreOffers® sign with our contact information on it. This means you get a professional MLS administrator answering the phone for you Mon-Thu 9AM-7PM, Fri 9AM-5:30PM, Sat 9AM-5PM, Sun 9AM-4PM, and we forward all buyer leads to you directly and schedule appointments. This service is called Agent Assure® and is $159 as an add-on or free with our Altru® program. List on the MLS for a flat fee without giving up the right to sell By Owner and get 100% contract-to-close representation. Contract representation is so important for many reasons but the most critical reason to list using Altru® contract-to-close representation is so Realtors® only talk with and negotiate through Altru® Realty brokers. This assures you peace of mind that there will be no mistakes in getting you the highest offer. Additionally, Realtors® prefer working with another broker as apposed with the seller. List with a trusted and reliable DE licensed flat fee MLS broker such as those approved by GetMoreOffers.com. Our flat fee clients frequently give us praise by saying that we are truly light years ahead of other flat fee MLS and full-service companies in Delaware. And they are right because we have invested in the future and understand what sellers need. We have the longest hours in live phone coverage of any flat fee service in America (Mon-Thu 9AM-7PM, Fri 9AM-5:30PM, Sat 9AM-5PM, Sun 9AM-4PM), we forward all buyer leads to sellers in real time, have the best 100% paperless listing software and have special software to track contract negotiations and close deals without a hitch. Delaware has several nicknames, such as The First State, The Small Wonder, and The Diamond State. Its motto is Liberty and Independence. Located in the Northeastern part of the United States, between Delaware Bay and Chesapeake Bay, it is the 2nd smallest state, coming in behind Rhode Island. Dover is the capital and Wilmington is the largest city. The state tree is the American holly and the state flower is the peach blossom. The large Dover Air Force Base of the United States Air Force Air Mobility Command is located in Delaware and is home to the Airlift Wing of the United States Air Force. Delaware is the only state in the Union without commercial air service. Delaware was the settling place for colonies from Maryland and Virginia and the economies of these were chiefly based on tobacco culture and were increasingly dependent on slave labor for its intensive cultivation. By the end of the colonial period, the number of enslaved people in Delaware began to decline. It was on of the 13 original states to participate in the American Revlotion and became the first state to ratify the Constitution of the United States. The agricultural output of this state consists of poultry, nursery stock, soybeans, dairy products, and corn. Delaware's economy generally outperforms the national economy of the United States. This state is home to several giant employers such as University of Delaware, Bank of America, Wilmington Trust, AIG, Citigroup, Barclays, JPMorgan Chase, General Motors, and Chrysler. Delaware is most famous for the only state to have no sales tax on consumers. 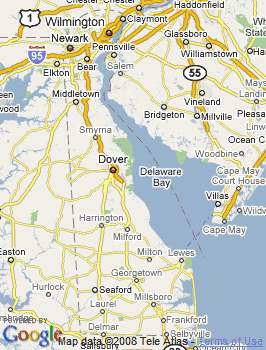 Delaware consists of only three counties: New Castle, Kent, and Sussex. It consists of several towns such as Delmar, Greenwood, Georgetown, Slaughter Beach, and Frankford; and cities such as Dover Base Housing, Glasgow, Greenville, Highland Acres, Wilmington Manor, and Long Neck. Institutions for higher learning include Delaware State University, Wilmington University, and the University of Delaware. The state has no places designated as national battlefields, national memorials, or national monuments; it has several museums, parks, houses, and other historic places. As well, it is home to the longest twin span suspensions bridge in the world, the Delaware Memorial Bridge.